Habermas defines religion along the lines of traditional worldviews or “strong” traditions that raise particular claims to truth based on things like moral principles and cosmological ideas about salvation that are not generalizable nor easily accessible to those who don’t buy into them. In this sense, religion is seen to function as both a source of meaning for individuals/groups that helps to bond communities together (i.e., it is a form of solidarity) as well as a form of authority and dogma that serves particular interests and often comes into conflict with things like scientific reason and opposing cultural or ethical worldviews. On the one hand, this definition holds certain strong assumptions about what religion represents and is thus susceptible to criticism from both theologians (e.g., because of its functionalist overtones) as well from scholars of religion who wish to problematize the complex genealogy of how we have inherited this term. Given the interest of some theologians in Habermas’s work, he has responded to their charges by speaking of religious “truth claims” (e.g., about the sanctity of life) and looks to place them in the realm of ethical-existential problems that all humans potentially share in common. To the best of my knowledge, Habermas has not addressed the heuristic use of “religion” and related terms (e.g., sacred, salvation, etc.). On the other hand, Habermas requires strong definitions—be it of religion, ethics or secularism—for his particular brand of critical theory, which focuses on the communicative dimensions of human interaction. Without some empirical basis (however provisional) on which to measure claims to things like truth, rightness and sincerity, Habermas maintains that power and coercion will prevail, along with distorted forms of communication that serve to mystify the possibility of rational debate. Whatever problems there may be in this definition from a theory of religion perspective, it is worth noting that Habermas’s position does not abdicate the role of critique as is common, for example, in the doxa of liberal “neutrality,” but rather seeks to uncover the conditions where people can do the work of critique themselves. A tall order, to be sure! While in his philosophical investigations, Habermas is interested in the complex genealogical relation between “religion” and “philosophy,” a topic that I will address in my next post, in the political arena terms like religion and secularism have more of a prima facie relevance for him inasmuch as they are based on the claims of social actors whose positions come to influence government policy as well as discourse in the academy and the public sphere. Until the late 1980s Habermas had assumed that religion was a private affair that would eventually fade into the background. Since the fall of the Soviet Union, however, and the development of his own distinct political theory in Between Facts and Norms (1992), he has grappled with the question of how the claims of religious traditions can be squared within modern liberal states. Crucial for his theory is that certain distinctions, like those between secularism and religion, not be leveled since, as he maintains, there are differences in kind between religious and secular reasons. Here “secular reasons” are defined as a mode of justification that points beyond one’s own community toward reciprocal perspective taking between different communities. In this sense, these distinctions are seen as necessary in order to clarify precisely what arguments are being made and to determine what could count as a basis for shared reasons held in common in plural societies. In short, Habermas’s critical theory aims to both deconstruct these and other concepts as well as to reconstruct them along normative lines that he believes are necessary to enable communicative reason within the public sphere. 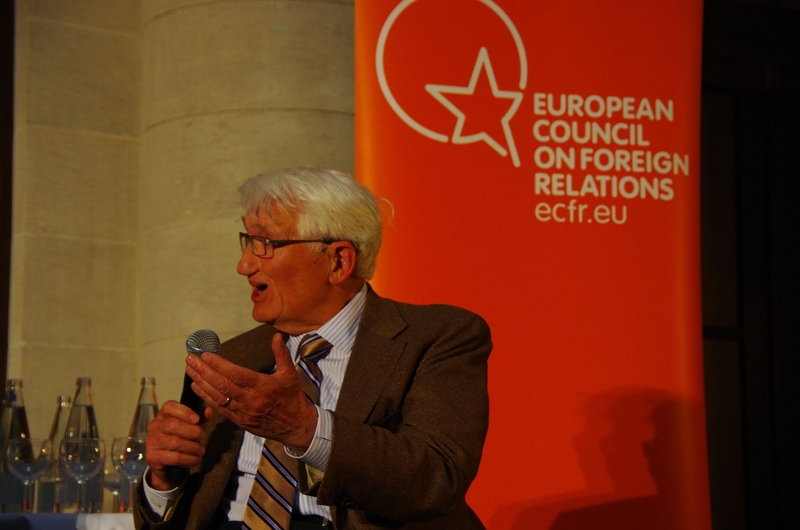 While affirming the idea of equal rights in the liberal tradition, Habermas is critical of its emphasis on individualism and its presumption of state neutrality between citizens. While affirming the general thrust of the civic republican ideal of popular sovereignty (i.e., citizen self-rule), he is critical of its tendency to support particular nationalist or ethno-centric claims, as well as to ignore the role of market-forces in shaping people’s identities. Deliberative democracy, by contrast, shifts the focus toward the role of civil society, or what Haberams calls the informal public sphere of opinion- and will-formation, as the main source of communicative interaction that can serve as a check on systems of government and extra-government power. Crucially, this ideal theory requires certain preconditions be recognized in order to proceed. 3. An epistemic stance toward “secular reasons” in the political arena, where a shared constitution is seen as the focal point for granting rights and mediating differences. In addition, since deliberation involves what Habermas calls “complimentary learning process,” where the burdens of cognitive dissonance cannot be held by one side alone, he also calls for “secular citizens” to overcome “a rigid and exclusive secularist self-understanding of modernity.” This is important, among other reasons, so that they might take religious citizens seriously rather than simply reject their claims out of hand. In order to achieve this, Habermas suggests an active process of “translation” between religious and secular truth claims, so that what may appear at first blush to be irreconcilable language games might prove to find some basis for mutual understanding. In my next post I will turn to this idea of translation, which comes mainly from Habermas’s philosophy of religion. Controversially, he has come to argue that religious language may contain certain semantic potentials that speak to existential needs that have been uniquely compromised amidst the perils of globalization and the hyper-individualism of the neo-liberal world order. While not discounting the potential problems with Habermas political theory, it is with his philosophy of religion that his theory is most susceptible to critique. This entry was posted in Matt Sheedy, Politics and Religion, Religion and Society, Religion and Theory, Theory and Method, Uncategorized and tagged Deliberative democracy, Liberalism, Religion, secularism. Bookmark the permalink.